Has it been a while since you hand embroidered? This sampler is a fantastic way to refresh your memory and get those Lazy Daisy’s and Backstitches flying again. Or, if you’d like to have a Zen few hours during the hustle and bustle of QuiltWeek, this is the class for you! We’ll talk about which stitches you’d like to learn/have a refresher and get through as many as we can. It’s like riding a bike. You’ll be amazed at what you already know! 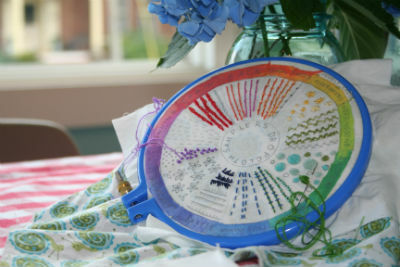 I’m in love with Dropcloth Samplers and the Colorwheel one is a personal favorite. It stitches up quickly and gives you a great primer for well-loved and well-used stitches. When I worked on it, I used shades of the color wheel colors in each section as I like to mix things up. No pre-prescribed colors needed. Stitch what you like! Your registration fee covers the sampler, package of needles, hoop, and your choice of cotton fabric for backing from the Studio Stash. dropclothStudents will need to provide their embroidery floss (choose a palette of your liking). If you want to stick to the color wheel theme, you can use one color floss for each section or fancy it up with shades of that color. Typical 6-strand floss is great or feel free to use whatever you like to stitch with. We also carry DMC and Sublime Stitching floss at the shop. Students get a 10% discount during workshops!